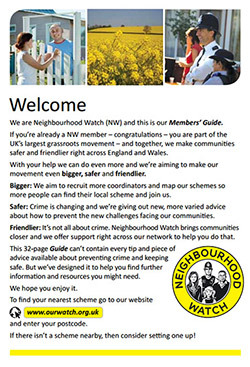 NHW is the largest voluntary organisation in the UK – one in seven homes across the country is a member of a scheme and they work with each other and the Police to reduce crime and the fear of crime in their community. In Hampshire we have over 10,000 schemes covering over 300,000 homes. In a time of cuts, the Police can’t deal with all the problems and issues arising from crime and anti social behaviour alone, they need the help of the whole community. NHW provides a way for local people to play an important part in addressing this balance and making their communities safer. NHW is a community initiative, and so how it looks depends on what the members choose to do.